*Make sure there are sufficient free memory and disk space. Typically, “Word experienced an error trying to open the file. Try these suggestions” error pops up when an installed third party application modifies the Word document which you are trying to open, while transmission. So, try below troubleshooting methods, when your Word file is not responding or failed to open by the Microsoft Word application. If you received the error throwing Word file in Outlook or on any other email applications, then chances are there that the file might have blocked. 1. Right-click on the Word file and select Properties. 2. 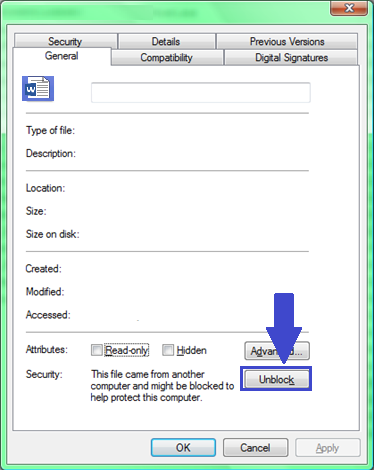 In the General tab, click the Unblock button located under Security (below the Advanced button). 3. Apply the changes and hit OK.
Once the Word document is unlocked, try to open it in MS Word app to see the “Word experienced an error trying to open the file. Please try the following suggestions” is fixed. If you still encounter the error, then try the next step. 1. Launch MS Word application, click File menu and select Options. 2. In Word Options wizard, select Trust Center, and click Trust Center Settings. 4. Save the changes and close Word program. Now, try to open the affected Word file. Try the next step, if the error still appears. 1. Launch the MS Word application, click the File menu and select Options. 3. Next, choose Trusted Locations and click the Add new location… option. 4. Browse and select the drive where your Word file is saved and check the checkbox “Subfolders of this location are also trusted”. 5. Click OK and close the MS Word tool. 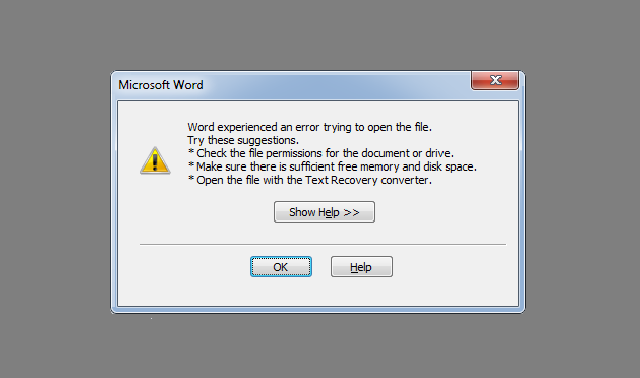 Now, open the Word file which is showing “Word experienced an error trying to open the file. Please try the following suggestion” error. If none of the above solutions resolve the error, then chances are there your Word file might be corrupt or damaged. So, you have to fix it before trying to open corrupt Word document in MS Word program. How to Repair Corrupt Word File? 1. Launch MS Wordand clickthe File button. 2. Click Open, then Browse and select the corrupt Word file. 3. Click the small triangle located beside Open button andchoose Open and Repair. Wait till the Word tool repairs your corrupt file. Previous Post:How to Sepia Tone a Picture in Photoshop? Next Post:How to Resolve “We Could Not Complete Your iTunes Store Request” Error?